President Donald Trump called out Senate majority leader Mitch McConnell (R-Ky.) for failing to pass a bill that would have repealed and replaced part of Obamacare in a tweet on Aug. 24. 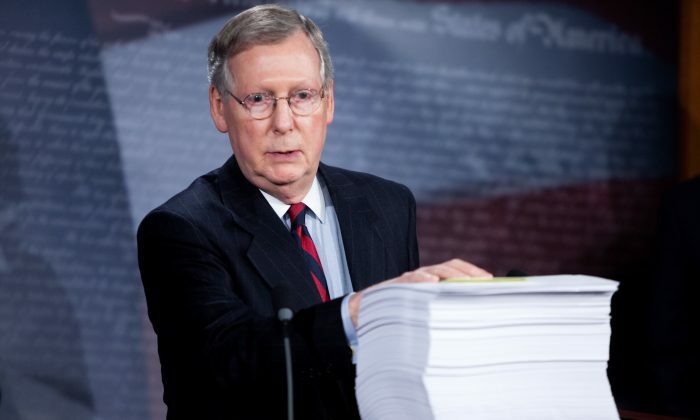 “The only problem I have with Mitch McConnell is that, after hearing Repeal & Replace for 7 years, he failed! That should NEVER have happened!,” Trump wrote, referring to the American Health Care Act bill in the senate. Two days earlier, in a speech in Phoenix, Arizona, Trump expressed his displeasure with the fact that, despite controlling both the House and the Senate, Republicans under the leadership of McConnell were unable to pass the bill. During Obama’s presidency, Republicans gained over 1,000 state and federal posts held by Democrats, mostly on the promise of repealing Obama’s signature legislation, The Affordable Care Act (ACA), also known as Obamacare. However, when voting on a Republican alternative to the ACA, three Republican senators, John McCain (R-Ariz.), Lisa Murkowski (R-Alaska), and Susan Collins (R-Maine), were against the bill, making the Republicans one vote short of a 50-50 tie. If a tie had been reached, Vice President Mike Pence would have given the deciding vote in favor of the bill. “We were one vote away. Think of it, seven years the Republicans—and again, you have some great senators, but we were one vote away from repealing it,” Trump said in Phoenix. Trump also re-iterated a suggestion he has made several times for the Senate to change the procedural rules to get rid of the filibuster rule, and instead vote with a simple majority. “We have to get rid of what’s called the filibuster rule; we have to. And if we don’t, the Republicans will never get anything passed,” Trump said. Trump also said in order to make more significant improvements to healthcare, a 60 vote majority is needed. “But some of the best things in healthcare require 60 votes,” Trump said, pointing to giving people the ability to buy insurance across state lines as an example. A day before Trump’s tweet, The New York Times reported that the president and McConnell had not talked to each other in weeks, suggesting that their relations were strained. The claim, which relied entirely on anonymous sources, received a quick rebuke when McConnell said in a statement that he and the president are in regular contact. “The President and I, and our teams, have been and continue to be in regular contact about our shared goals,” McConnell said in his statement. Trump has frequently called out media organizations for their inaccurate reporting and use of anonymous sources. “[The] truly dishonest people in the media and the fake media, they make up stories. They have no sources in many cases. They say ‘a source says’—there is no such thing. But they don’t report the facts,” Trump said at the rally in Phoenix. One such example of flawed reporting was called out by former FBI director James Comey in a testimony before the Senate Intelligence Committee on June 8. Talking about an article published by The New York Times on its front page on Feb. 15, Comey said that the story, which claimed that members of the Trump campaign had been in contact with senior Russian intelligence officials, was almost entirely wrong.